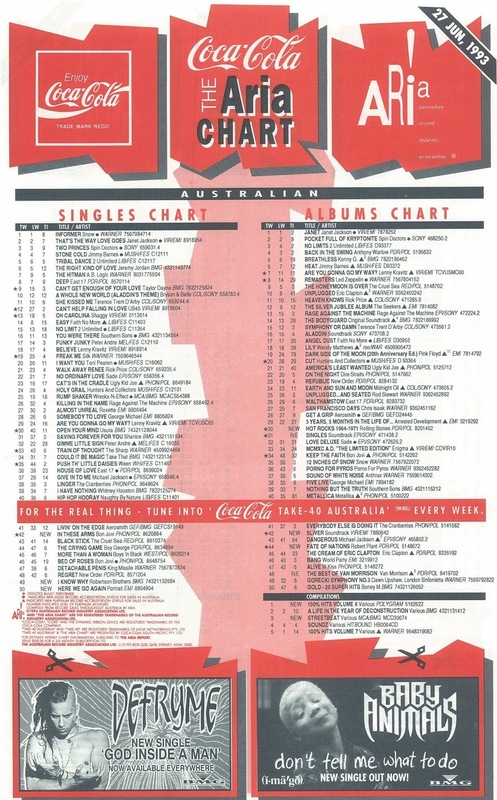 On the ARIA singles chart this week in 1993, there were a handful of ho-hum entries in the top 50, but something much more interesting was going on lower down. The week's top 100 was filled with new arrivals from groups that'd seen better days. From dance to rock to hip-hop, the acts had all had big hits relatively recently, but stumbled this time around. In most cases, it's because their material wasn't up to standard. An artist that was having a much better time of it was rapper Snow, whose unstoppable hit, "Informer", spent a fourth straight week at number 1. Sampling the 1979 song of the same name by disco singer Sylvester, this third release by British DJ/producer Francis Wright would be his final top 100 appearance - and only just! Released ahead of "Easy" in other parts of the world, this track from Angel Dust finally got its turn in Australia, but couldn't keep Faith No More's hit tally going. Following this Red Hot Chili Peppers-ish single's lack of success, it's little surprise Aerosmith went with power ballads instead for the next couple of releases from Get A Grip. Hip-hop duo Wreckx-N-Effect were also unable to come up with the goods on the chart, with this follow-up to top 10 smash "Rump Shaker" ensuring they remained a one-hit wonder. Their previous two singles had massively underperformed, but this third release from Fabulous Beast probably did about as well as it deserved, especially considering the album featured much better songs. The R&B vocal groups were coming thick and fast at this point, with this second single by quartet Portrait following Boyz II Men, Riff, Shai and Silk into the top 50. 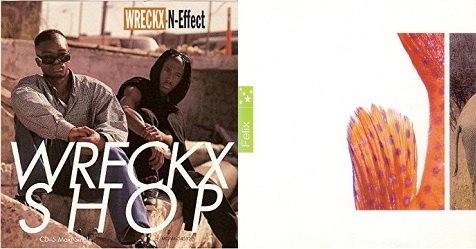 At the new jack swing end of the spectrum, "Here We Go Again" sampled Michael Jackson's "I Can't Help It", a track from his Off The Wall album. Before they became best known for their 2000 update of the Home And Away theme song, this trio comprised of siblings Ben, Geoff and Stuart Robertson sneaked into the top 50 with their Rick Price-esque debut single. This is as high as the brothers ever managed to reach on the singles chart, despite lifting four tracks from debut album Symmetry and, in the second phase of their career, issuing three singles from their second album, 2002's Here. The guys are still making music, albeit without Stuart, who was replaced in the line-up in 2004. Ten was proving to be a lucky number for Bon Jovi, who peaked there for the third time in a row with the third single taken from Keep The Faith. While I was happy it was time for another uptempo tune from the band after power ballad "Bed Of Roses", I have to say I've always found "In These Arms" kind of dated and generic, especially compared to the album's title track, which had embraced a more modern sound. There was plenty more life in the album yet, with three more singles to follow - all of which we'll see reach the top 40 in the months to come. Next week: our three new entries revisit the past - in two cases, thanks to some inspired samples, and in the other, due to a veteran artist delving into his own back catalogue. You know it's a snoozeworthy week when the highest new entry is at number 42! The 'Off the Chart' entries are more interesting. "Eat The Rich" is a good song, but not the best choice of single off Aerosmith's new album, while "Everything's Ruined" is one of Faith No More's best songs (it has a great video too). I'd also like to add, after collecting 30 CD compilations from the '90s, my collection of vinyl compilations from the '80s has now begun! I managed to find "1981 Over The Top" the other day. Well, see ya, guys. I'm off to Vietnam to celebrate my 40th birthday. Back in 3 weeks, then I have some chart catching-up to do. Have a good one! It was around this time that I thought I'd record the Friday new releases segment on rage, in addition to the top 60. This was the only time I heard Felix's 'Stars' at the time. There is (or at least once was) a TOTP performance of it, where the (live) singer actually sounds identical to the record, which I wasn't expecting. I remember thinking the 'Everything's Ruined' video looked really low-budget. 'Wreckx Shop' doesn't have any hooks. 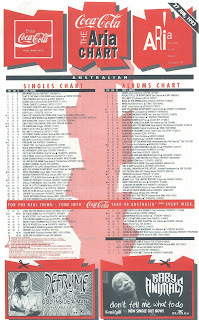 I wasn't too enamored with any Boom Crash Opera singles from 'Fabulous Beast'. If I remember correctly, 'God Inside a Man' had an interesting video, with voodoo-like rituals (I think). I don't have it, though. I hadn't thought about that Portrait song in a LONG time. I probably haven't heard 'I Know Why' since '93. I remember the chorus, and liked it. It is, as you say, very Rick Price. I don't really understand why or how Bon Jovi made a successful transition into the 90s, despite not really updating their sound, as you say, where most of their contemporaries were struggling by this point (if they were still going). About the only thing 'In These Arms' has going for it is that it is an improvement on the awful 'Bed of Roses'.